Banana Cream Cheese Bread for Breakfast! I love making small loaves of quick bread. Especially when I have some ripe bananas that need to be used. I have baked a dozens upon dozens of loaves of banana bread from a recipe I got from my sister in law, Barb. Trust me, anything that Barb makes is amazingly awesome. There have been times when I have made 4 loaves at a time because you have to bake these breads for up to an hour and I hate heating up the house for something that is going to be eaten before it is even fully cooled off. The other day I had a coupon for Michael’s and decided to go ahead and get the mini loaf pan I have had my eyes on. Every time I walk by the baking isle I just can’t get over how adorable the little loaves and so finally I caved and bought it. I was going to bake my usual banana bread recipe but then I saw this! 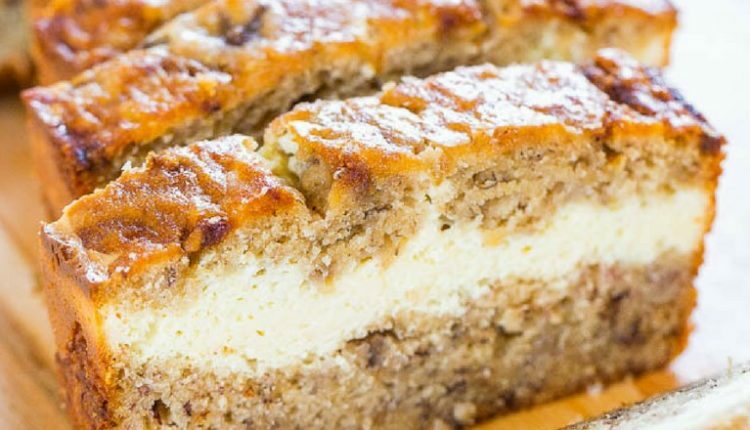 Banana bread with a baked in cream cheese layer? Wowza! My sister in law if going to be shocked when she slices into a loaf of this! And think of how beautiful it will look on a plate of baked goods at your next coffee time with friends. This is what Averie of Averie Cooks has to say about her yummy recipe. Quick tip: Bread will keep airtight at room temperature for up to 1 week, or in the freezer for up to 6 months. Recipe and images courtesy of Averie of Averie Cooks.